Offering a wide range of services to ensure your horse receives the highest level of care and individual attention. My name is Charlotte. 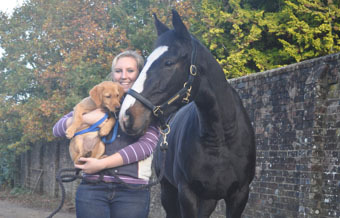 I am a freelance groom with plenty of experience working in the equine industry. At university I studied Equine Sports Science and completed with a BSc (Hons) degree, this has given me an in-depth background into the scientific side of the horse, why things happen, how it affects the horse and how to deal with them. Since leaving university I have worked for a variety of people in different yard environments including private/home setups, livery, 4* level eventers, professional polo players and I've also spent time working abroad. Through this I have had the opportunities to put everything I have learnt on paper into practice and have dealt with many situations ranging from general grooming to veterinary care. I have also gained my HGV (Cat. C) licence. Please view my ‘services’ page for more details on what I can offer. Short or long-term contracts welcome. I work within the areas of Kent, East Sussex, West Sussex and Surrey. I will travel further, up to 20 miles away but there is a surchage of £10 for mileage over 10 miles from my base. Please contact me for further details.